Samsung advertises the Samsung Health mobile app in a new commercial, showcasing its all-new design and the variety of content it provides. 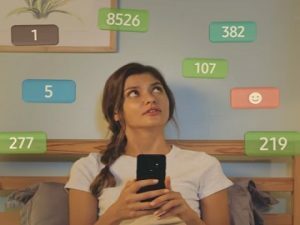 The ad shows a young woman using the app for different purposes, such as tracking her fitness, weight, diet, food and sleep, throughout the day. New features, including Weight Management, which comes to help those who want to reach their ideal weight by automatically calculating their calorie balance, Global challenge, which is aimed at making walking more fun by having users compete against their friends in walking challenges, and Program, which includes professional coaching for exercise from fitness experts, are also showcased. Samsung Health allows its users to record and track their daily activities and life as they get closer to their health goal and even earn fantastic rewards through events hosted by Samsung Health. The commercial ends with the young woman sitting in her bed, before going to sleep, and looking at what the Samsung Health app recorded about her fitness, weight, diet, food, and sleep that day. “Win the day” an onscreen line reads.